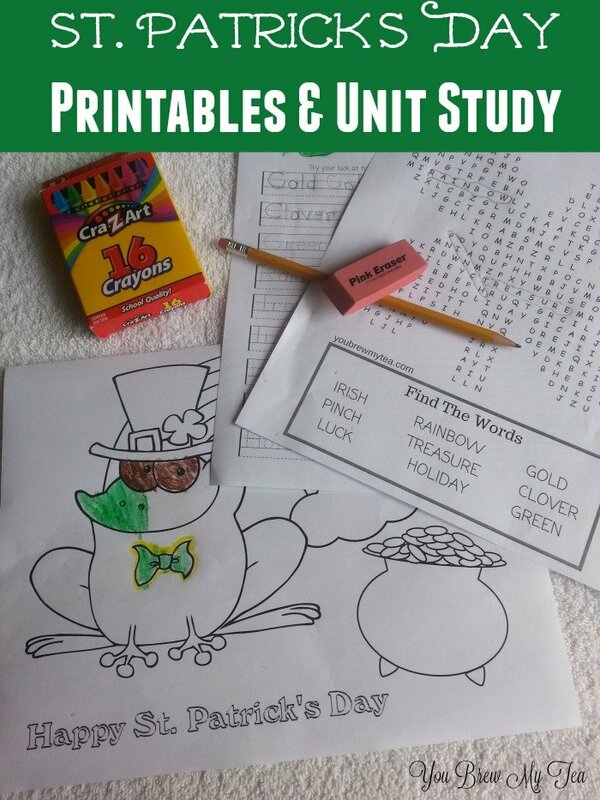 I love building homeschool unit study lessons around holidays, and these St. Patrick’s Day printables are perfect for a great beginning to a unit study that will have you giggling and having fun while sharing with your children about this fun green-themed holiday. Unit studies are an excellent way to get your kids excited about learning. We typically choose a topic and spend a week studying it using different things like printables, books, movies, games and even on occasion we’ll make a craft. It is easy to incorporate all of the basic education subjects into a unit study when you think outside the box. 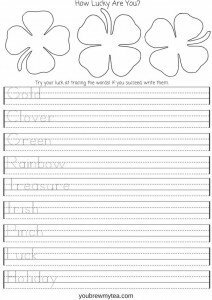 Language Arts: These St. Patrick’s Day printables are ideal for handwriting practice, spelling, and vocabulary. They help our son to recognize the words, learn to spell them and then we work with him on the definitions of each word on the word search and spelling sheet. Check your local library or grab the books below to read about the holiday. History: March 17th is celebrated each year as St. Patrick’s Day. It is indeed, a religious holiday that celebrates the patron saint of Ireland. It has become a fun holiday that is well known for green foods, Lepaurachans and of course, the always fun pinch if you aren’t wearing green. There are great books about the history of St. Patrick’s Day you can read with your kids, as well as checking out websites and even videos to learn more about the origin of the holiday. Science: St. Patrick’s Day always brings to mind both rainbows and shamrocks. Studying these is a great way to include science in your unit study. Since both words are already on the St. Patrick’s Day printables, you can easily include them in your vocabulary lessons, but also in science. Take the time to talk about what plant species the shamrock comes from, best places clover grows and of course what creates a rainbow. You may even take the time to share about prisms. Math: There are tons of fun games, St. Patrick’s Day printables, and projects you can do to work math into this holiday themed unit study. Counting the number of leaves on a clover. Making pots of cold and counting the number of coins in each. There are tons of fun and unique ideas for adding math to your unit study. 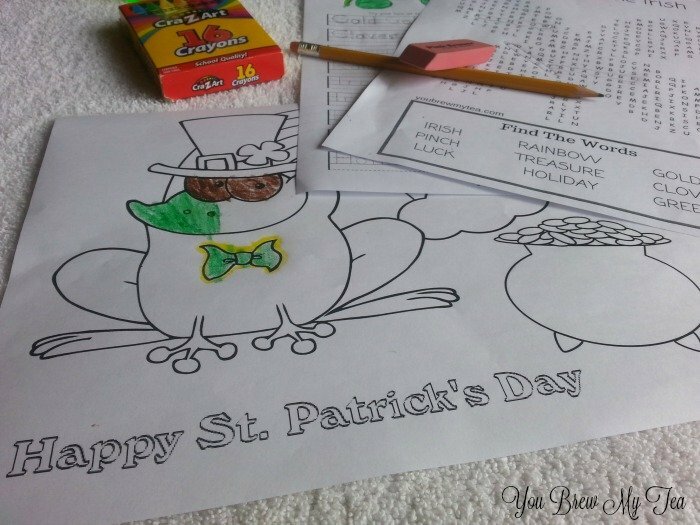 I love taking easy things like our St. Patrick’s Day printables and creating a week of school work around them. Take a subject per day, and of course, add in some great St. Patrick’s Day treats along the way for a “home economics” class if you wish! You can even check out some cute printable saying and craft ideas too from our friend at Crafty Mother of 2! 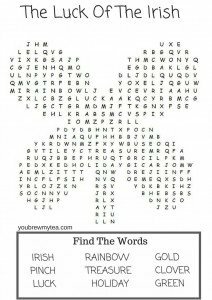 Print our St. Patrick’s Day word search and St. Patrick’s Day spelling sheet below! What a great list of St. Patrick’s Day unit study ideas!! We love making unit studies for holidays and other special days to learn about in our homeschool. Pinning, tweeting, and stumbling. Thanks so much for linking up with Inspire Me Monday. Have a great week!! I love including learning in our holiday celebrations! (That writing worksheet is awesome!) Thanks for sharing at Merry Monday this week.